Substitutes - For Michigan: Ayers for Teetzel, Baker for Juttner, Pingree for Stuart, McLean for Hogg. For Ohio: Baker for Jones, Culbertson for Urban. Touchdowns - Stuart (3), Hannan, Hogg, Pingree. Goals from touchdowns- Hogg 5. 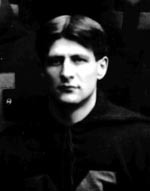 Officials - Knight, Princeton; Wilson, Ypsilanti. Front row (left to right): Brophy, Mackey, Leonard, Engensberger, Richards, Stienie, Waite. Second row: Purdy, Urban, Captain Hawkins, Saxby, Scott. Third row: Butcher, Benedict, Segrist. Back row: Culbertson, King, Sykes, Enos, Dyer, Miller, Segrist. Michigan had no trouble in defeating the Ohio State University representatives in Saturday's game. Two halves of 20 and 15 minutes respectively were played and the score was 34-0. It was not so much Michigan's strength as Ohio's weakness that brought about the score. the visitors lined up with three of their best players absent, while Michigan put her best team on the field. while the form of the varsity team was not on the championship order it showed an improvement over the Saturday before that was most encouraging. The interference was better, the playing snappier, and the defensive work stronger than ever before. In the line the work of Caley at guard was especially strong. Caley opened holes of the biggest kind in the Ohio line and made interference that repeatedly enabled the backs to make long runs. Snow at the other guard position also showed up strong. Lehr, Juttner and Baker were on a par at tackle, and it was through these positions that the Ohioans made most of their gains. Bennett, Teetzel and Ayres on the ends were stronger than ever, but still seemed somewhat week on defensive work. All of the backs played great ball. Hogg bucked the line hard and went around the ends for consistent gains. Stuart, who played for the first time, has the longest runs to his credit, due to the way in which he followed his interference. Pingree made several good gains and a dash of 50 yards across Ohio's goal that was annulled by Baker's off-side play. Talcott at quarter also played for the first time and did well. His passing was surer than any he has shown in practice. In the first half a high wind favored Ohio, but they had only two or three opportunities to take advantage of it, as Michigan kept possession of the ball through almost the entire half. All of Michigan's points were made in this half. Hannan kicked off and the ball was downed on the 25 yard line. Ohio kicked to the middle of the field. Hogg made 5 yards, Stuart 5 and then 10, Hannan 5, Hogg 10, Hannan 2, the ball was fumbled and regained for 3 yards gain. Hogg advanced 5, and Hannan 10 for a touchdown. Hogg kicked goal. Score 6-0. Time 6 minutes. Ohio kicked to Stuart at the 10 yard line and he came back 20 before being downed. Bennett went around the end for 4 yards. Teetzel skirted the end for 5 and followed with a gain of 4 yards. Hogg then around end for 32 yards behind interference, but was stopped by a star tackle by captain Hawkins, Ohio's full back. Stuart made 5 through the line, Bennett made 4, Stuart 15 more, Hogg 5, Hannan 5, and Stuart went over for the second touchdown. Hogg kicked goal. Score 12-0. Time 9 minutes. Hawkins kicked off to Michigan's 40 yard line and Talcott brought it back 29 yards. Hogg gained 5, Stuart 8, Hogg 12, Stuart 5 and then 16, Hogg 23, Hannan 4, Hogg 4 and then across goal, for the touchdown. He kicked a hard goal. Score 18-0. Time 12 minutes. Another touchdown was made in two minutes by Stuart by a run of 26 yards. Previous to this Hannan had made gains of 22 and 4 yards, Stuart 15, Hogg 4, 6 and 9, Bennett 7 and Teetzel 8. Hogg missed goal. Score 22-0. Time 14 minutes. Stuart also made the fifth touchdown after making gains of 22 and yards. Talcott made a long gain of 35 yards in the kickoff. Bennett made an end run of 15 yards. Hogg kicked goal. Score 28-0. Time 16 minutes. After Hannan, Juttner and Stuart had 10, 15, and 9 yards respectively, Stuart was taken out and Pingree put in. Hogg made 4, Pingree 12, Hogg 3, Teetzel 10, Bennett failed to advance, Pingree 12, and Hannan 23. Off-side here gave the ball to Ohio, how punted for a gain of 20 yards. Hannan made 8, Pingree and Juttner 5 each, and then Pingree crossed goal for a touchdown. Goal was kicked. Score 34-0. Time 19 minutes. 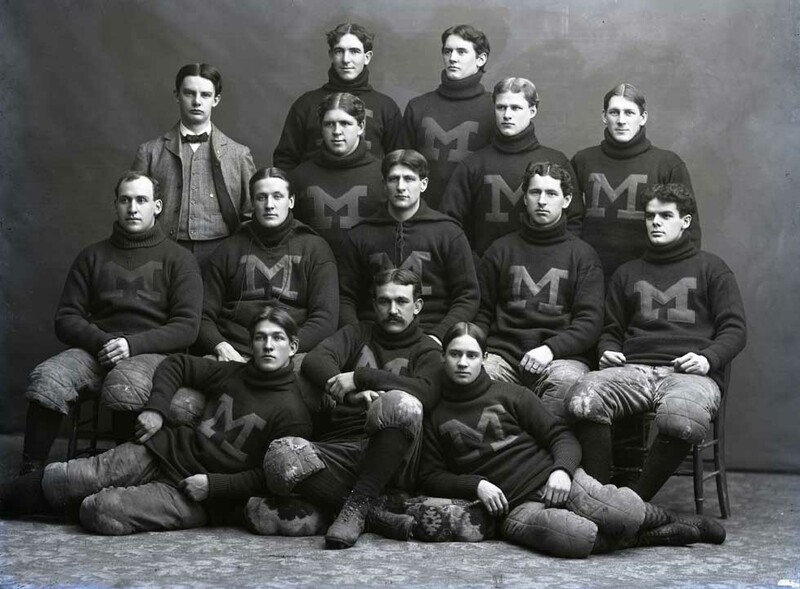 After the kick-off Michigan advanced the ball to the 20 yard line, where Hannan attempted a field goal in which he failed. Ohio got the ball and made a gain of 5 yards as time was called. In the second half Michigan played for the most part a kicking game, putting Ohio on the offensive. Hogg was hurt in this half and retired, McLain coming in. The largest gain made by Ohio was 7 yards. Other ranged from 1-5 yards and were few. Neither side scored in this half and when time was called the ball was in Michigan's possession on Ohio's 15 yard line. 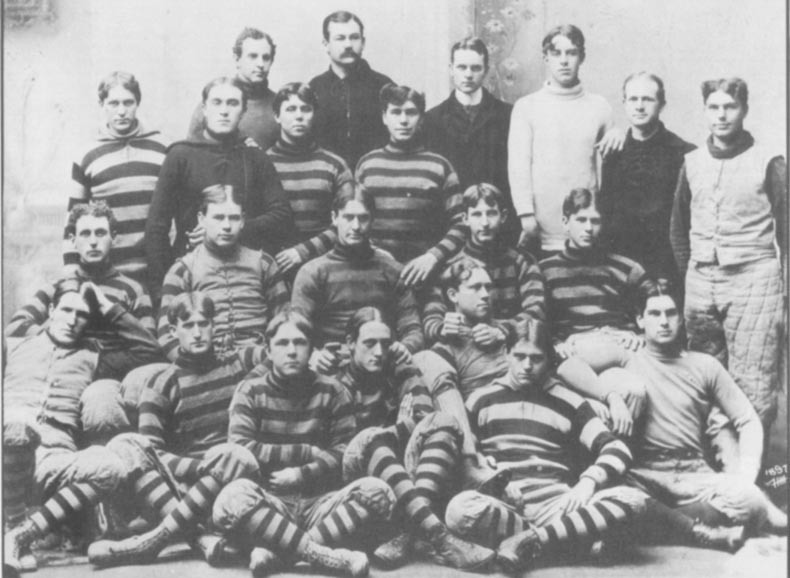 For Ohio the best playing was done by Hawkins at full-back, Jones at center and Saxby at center. The entire team played gentlemanly and not a single wrangle arose to mar the game. The team is coached by Edwards, Princeton '96. Several members of the faculty accompanied the team.